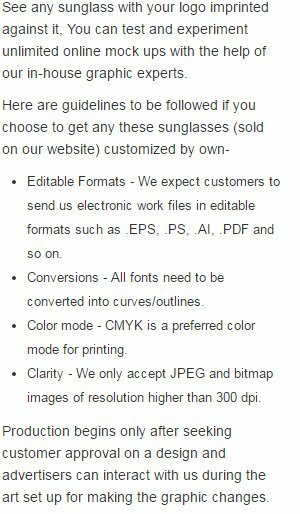 Customized dark sunglass package makes a very unique gifting choice for every advertiser who is aching for instant attention. Each package comprises of sunglass with black plastic frame, dark grey lens, packed in black micro fiber pouch. This lens has resistive UV power and advertisers seeking it for corporate gifting purposes can seek it in outdoor gift box. When ordering blank items of this product either exactly 1 or atleast '+12+' must be ordered!